The beautiful Mold Gold Cape is certainly worth having another look at. This wonderful article was found in 1833 by workmen quarrying for stone when they came upon a stone cist. They had been digging in a burial mound named Bryn yr Ellylon, the Ghost or Goblins’ Hill near Mold, Wales. The person in the cist was wearing the cape. Unfortunately the skeletal remains were fragmentary and the cape crushed and broken into several pieces. Many pieces were removed by various people, and it took many years to gather as much as possible. At first it was thought to have been a corselet or breast plate which passed beneath the arms, but by 1904 the British Museum was presenting it as a chest ornament for a pony. By 1950, it was finally suggested that it could be a cape. Another fifty two years went by before all the pieces had been put together, which proved that it was a cape. A cape which would only have fitted a slight person, thought to have been a woman. No weapons, axe, mace, ‘wrist guards’ or other male accoutrements were found with this person. 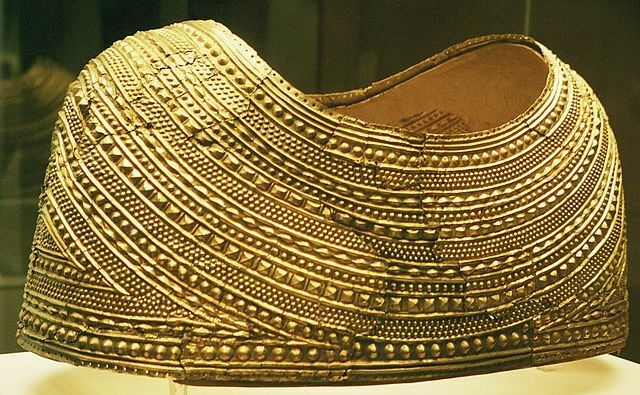 The cape was made out of a single ingot of gold, which was then decorated with rows and rows of different shapes. It looks rather like strands of beads between folds of cloth. The motifs have both Continental and indigenous roots. Some similar designs have been found in France, which are believed to have drawn on designs from central Europe. 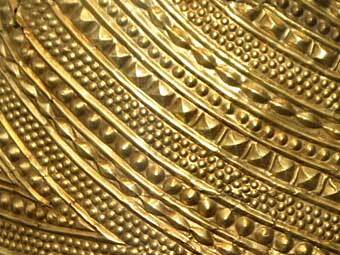 The lenticular bosses have been found on bronze spacer plates for a necklace in Migdale, Scotland, and on a bronze armlet from Melfort, Scotland. This motif, surrounded by fine dots outlining the shape, seems to have been used in Scotland for some time, and appears to be part of the indigenous repertoire. This cape is unlike anything found from that time period, or any other period. The craftsman was an exceptional goldsmith, with an impressive artistic flair. It must have made a huge impression on all those who saw this object. At that time, 1900-1600 BCE, it is estimated that there may have only been fifty bronze daggers in all of the UK and Ireland. So most folks were still using stone tools, while this person was walking about with a gold cape. I think of these shapes as houses (large domes); seeds (small domes); lenticular shapes (beans); pyramid shapes ( temples? ); rectangular shapes (metal ingots). However, the most standard shape of ingots in ancient times is shown in fig. A. A hieroglyph from Urartu, an Iron Age kingdom around Lake Van and Lake Urmia, looks more like fig. B. So perhaps these shapes are meant to be ingots of metal. It is believed that this very wealthy person may have had connections to the Great Orme copper mine, which was the biggest copper mine in Europe at that time. Who and what was this person? Queen? Priestess? The Oracle? “Oracles are best in the defence”, says the side of the Queen Stone which points in the direction of North Wales. 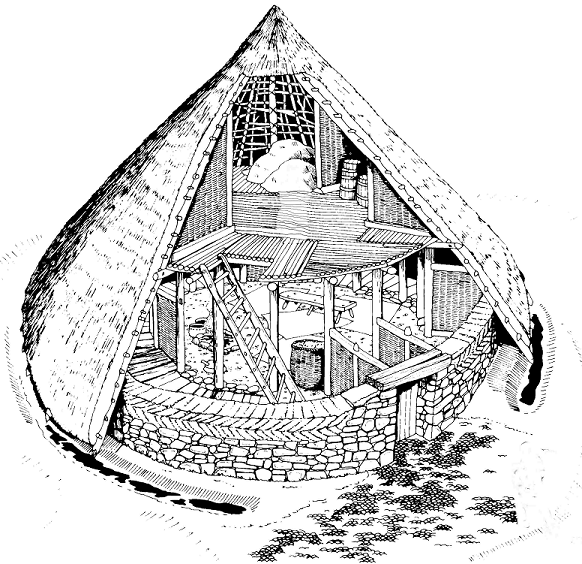 The Neolithic house below, named Cul a Bhail, was found on Jura, an island off the west coast of Scotland. It is very much like a tholos, although they were more dome shaped. But different materials sometimes make for a slightly different shape. The tholoi on Cyprus had stone foundations and mud brick domes, and in Mesopotamia they were made from mud brick. The mud brick was plastered over with adobe, while this house was made of stone, wood and thatch but the basic idea is the same. There were bronze straps, other flat pieces of gold work, and 200 to 300 amber beads found with the cape. The bronze straps are thought to have given the cape extra support. The other gold pieces are a puzzle, no one seems to know what they may have been. It is thought that the cape was lined with leather, and decorated with the amber beads at the neckline and at the bottom. This could have been done all in one step. 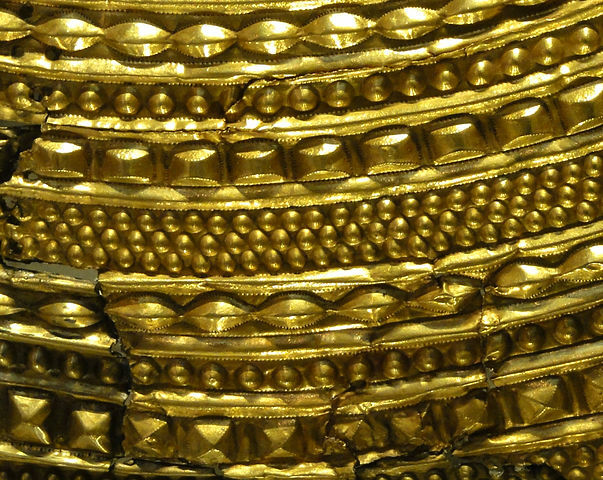 The amber beads would have covered the holes in the gold around the edges. This article has no designs the same as those found on the treasures from Bush Barrow, Golden Barrow, or Clandon Barrow. Although it has been dated 1900-1600 BCE just like Bush Barrow and the others, it isn’t known whether the same person made this cape. 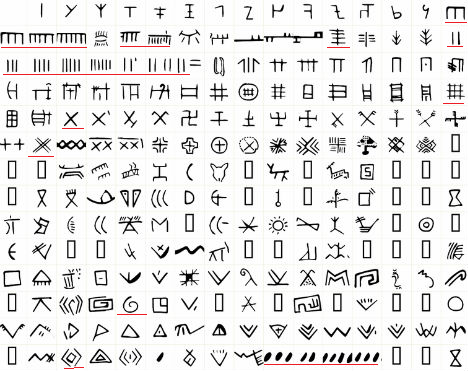 Vinca or Old European script with Ogham symbols underlined with red. The people of the Vinca culture are the oldest metallurgists to date. 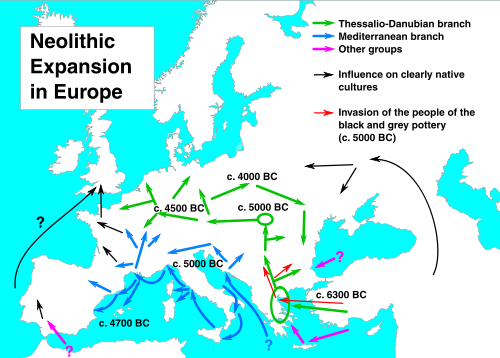 Their culture seems to have come to an end around 3200 BCE, more or less pushed out by other Indo-Europeans migrating in, at which time many of these people migrated to other places. Vinca territory included Serbia, and parts of Romania, Bulgaria, Bosnia, Montenegro, Macedonia and Greece. The Varna culture, also in that area and closer to the Black Sea, was not far from Vinca territory, and they were making gold ornaments in 5000 BCE. There were so many ornaments that archaeologists came to the conclusion that these were very common, everyday decorations, since they were found all over the settlements, and not just in graves. This whole area eventually became Thrace. The Thracians were well known for their beautiful metal work. The following map shows the dispersal pattern of the Vinca in green. Their artefacts have been found as far away as France. And perhaps Wales? There are several reasons for this theory. The biggest copper mine in Europe was at the Great Orme in Wales at the time when the cape was made. Ogham uses many Vinca symbols. The Vinca spoke a Proto-Indo-European language, wherein W and Y were used both as vowels and consonants. This is also why the Welsh language seems full of consonants, but W is pronounced oo or eu in Welsh, and Y is usually pronounced as I. This makes a word such as Llwyd seem so impossible to say. Ll also has its own pronunciation which is impossible to describe on paper. The last piece of this theory has to do with Y haplogroup E1b1b1, it is one of the unusual varieties in the British Isles, and is said to have spread from the Balkans, which is where the Vinca culture was. In the North Wales town of Abergele, 33% of the men tested, carried this DNA. 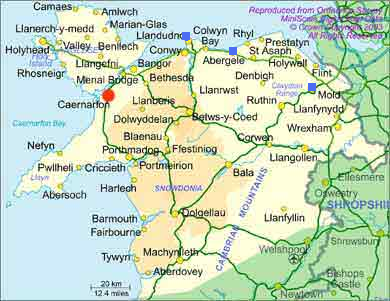 The three blue squares are at Mold, Abergele and the Great Orme. Abergele is closer to the copper mine than Mold is. Did some of the Vinca make it to Wales, take up mining copper, and become wealthy enough to have the gold cape made? 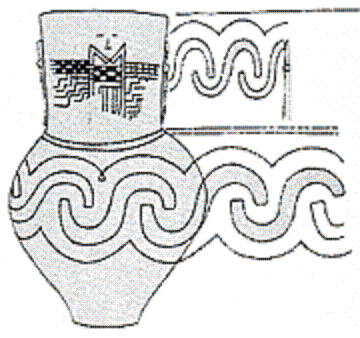 The picture above shows a painted Vinca vase, the date is not given, but would be before 3200 BCE, and possibly a thousand years older. It has a design made like an M, but it is actually two separate pieces which make up this M. It’s more like a 7 and a backward 7. This sign can be found several times in the script, used several different ways. In this case there is a face above the V. It looks like the Akhet again. The Sun between two mountain peaks. Looks very much like the Akhet on the Folkton Drums. The Balkans are named Old Europe, it had settlements of 2500 people and more, a thousand years before such things show up in Mesopotamia, unless the dates for that area are incorrect. This was a well organized society with orderly villages, farming, fishing, gathering and hunting. There seems to have been enough surplus food so that people had extra time for pottery, weaving, mining and metallurgy. Their religion was based on the Mother Goddess, the Earth and her attendant the Bull/Sun God. That isn’t all that different from Celtic religion with its Triple Goddess, the Earth, and Cernunnos, her stag/man/Sun consort. The bull has been an important symbol since very ancient times. Some of the oldest ‘cult’ figures were small stone bulls made at Mureybet. It figures heavily in Celtic art. The Vinca culture was already a well developed society by 5000 BCE, and may be at the root of all later higher civilizations, such as Sumer, Egypt and Crete. Then again, we haven’t seen everything which will be excavated at Gobekli Tepe as yet. Their stone carving was very advanced for 9000 BCE. Archaeology is full of puzzles and amazing finds, which are changing our view of the people in ancient times. Thanks to modern technology, anyone can scan the earth for geoglyphs, odd formations, see the different colours in fields, indicating buildings, tumuli, roads, etc. Or they can look at the ocean floor, and spot ancient flooded settlements, old coastlines, ancient lakes and rivers, and sometimes find things which look like roads. It’s a fascinating world, I just wish we knew more about it. 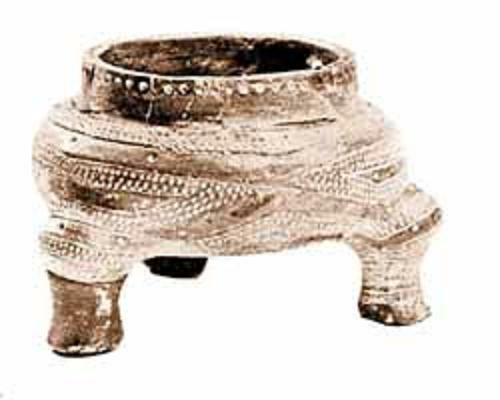 Vinca footed bowl and article, Internet Library of Serbian Culture: Archaeology. This entry was posted in Ancient History, Bronze Age artefacts and tagged amber, Bronze Age artefacts, Great Orme copper mine, Mold Gold Cape, Old Europe, Vinca script. A great article, and good research. I learnt a few things in this article. I agree, archaeology is full of puzzles. I have seen some of the Vinca script on rock carvings in Italy, and also on cave paintings. Thanks, glad you enjoyed it and leaned something. The research is what makes me a slow blogger, and although I do use Wiki, I like to have more sources than that. Wikipedia is not always reliable, so your approach of going for multiple sources is good. This is what makes blogs like yours valuable since you have quality over quantity.